Scientists have a new laser sensor they say can detect roadside bombs, the cause of more than half the soldier deaths in Afghanistan and Iraq. A team at Michigan State University published their research in the scientific journal Applied Physical Letters - but only in so much detail. Because of the laser's sensitive nature, they won't explain exactly how it works. What they will say is that the laser and the method were originally developed for microscopes. And they told the BBC the laser detects the vibration of molecules inside an improvised explosive device from a distance. The technique is called "coherent anti-Stokes Raman spectroscopy," and it's sensitive enough to detect low concentrations of explosives from a distance of one meter. It can also tell the difference between explosives and things that might seem like explosives but are harmless - which is good for preventing needless evacuations. Currently, the approach for protecting soldiers from IEDs is defensive. Radio frequency jamming devices disrupt the cell phone signals used to trigger the bombs. 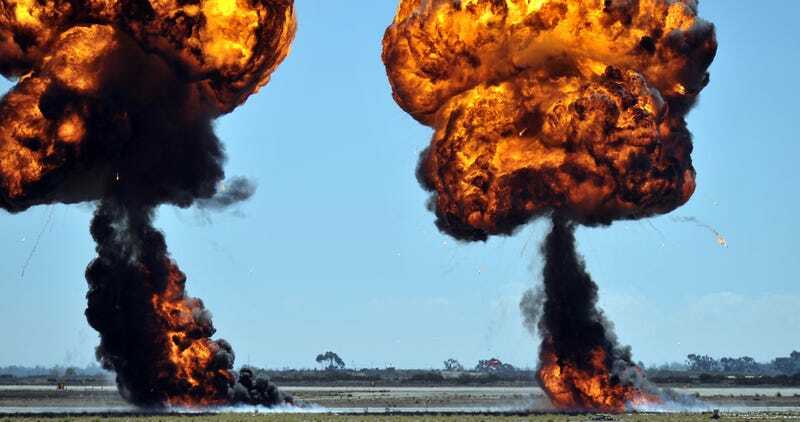 NIRFs, or neutralizing improvised explosive devices, emit a high-frequency radio pulse to deactivates IED electronics - microwave-pulsing devices do the same by frying the wires. The current research falls under the category of LIBS, or laser-induced breakdown spectroscopy. Of course all of the non-laser techniques require knowing a roadside bomb is out there. So let's hope this latest work provides an preventive, life-saving detection system.